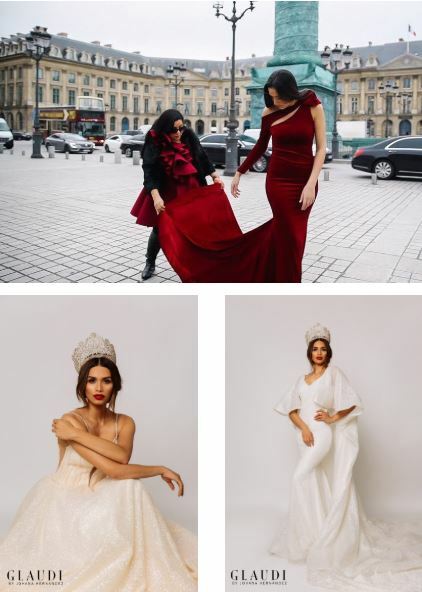 Celebrity designer of Salvadorian heritage Johana Hernandez teams up with Salvadorian beauty queen Marisela de Montecristo to represent the Central American country on the world stage. GLAUDI by Johana Hernandez will grace the Miss Universe stage in Bangkok, Thailand this December. Creating couture fit to represent El Salvador is especially meaningful for GLAUDI by Johana Hernandez as we approach Hispanic Heritage month (September 15th – October 15th). Central American representation is pertinent to capturing the diverse tapestry of our collective, celebrating outstanding members of the Hispano community, and giving specificity to the meaningful contributions of our comunidad. Johana proudly embraces her parent’s Salvadorian heritage and is honored to partner with Salvadorian beauty queen Marisela de Montecristo. Marisela rose to international fame when she famously became the first, and only, Central American winner of the top rated Univision beauty competition; Nuestra Belleza Latina, or “Our Latin Beauty”. This rare victory for a Salvadorian beauty, even on a Hispanic platform, is poignantly informative of the particularly steep climb Central American talent and entrepreneurs alike face. Similarly, Johana’s continued accomplishments in fashion as a designer and business woman truly capture the fighting spirit and values instilled in her by her immigrant parents. Johana has dressed stars like Gina Rodriguez, Paulina Rubio, Nicole Richie, Jessica Simpson, Gloria Trevi, Lucero, plus has appeared in LA Fashion Week, New York Fashion Week, and Paris Fashion Week. We invite you into GLAUDI’s creative process like never before, and open our doors to you as we construct the Miss Universe gowns. Learn about Johana’s creative process, what inspires her, how she works to create modern yet timeless pieces, and why she holds her Salvadorian culture so close. Document GLAUDI’s journey to Bangkok. GLAUDI also joyously announces we will be showing during Paris Couture Fashion Week 2018. The GLAUDI collection by Johana Hernandez will open the Paris haute couture line up on September 25th, 2018. We will also close out the evening, which will take place at the iconic Place Vendome, a historic square in Paris home to the world’s most legendary fashion houses. Cherishing her humble beginnings, Johana hopes her continued trajectory and strides in fashion inspire young girls everywhere to work towards their dreams tirelessly. Anything is possible for the GLAUDI woman.